Most of the mountains listed here are perfect for hiking activities but will make you sweat first and give you a different view of nature atop mountains before pulling off your summer wear. Zambales is one of the top summer destinations in Central Luzon because of its proximity to Metro Manila. Beaches and island hopping are the best activities here. To add worthwhile experience in your visit to Zambales, come to Anawangin Cove via Mt. Pundaquit. Yes, that’s correct. Pass through first the summit of the 464-MASL (meter-above-sea-level) mountain before enjoying the beach of Anawangin. You will enjoy the view of the West Philippine Sea and its islands from its peak. A day is not enough to make the most of this trip. So you may try to camp out in Anawangin Cove after your Mt. Pundaquit trip and enjoy the beach. The next day, you may still want to visit other islands like Capones Island before calling it a day. How to get there? From Metro Manila, ride a bus bound for Iba, Zambales, then alight at San Antonio Public Market. From the wet market, ride a tricycle going to Pundaquit. Then from Anawangin Cove, rent a boat going to Pundaquit and then a tricycle going to the bus station bound for Manila. Pico de Loro is one of the best mountains to climb this summer. With its lush forest trail, it will protect you from heat during this season. The trail is beginner-friendly but climbing to the summit and the monolith will require a lot of courage. From the monolith, see the breath-taking Nasugbu beach and other mountains in the Calabarzon region composed of the provinces of Cavite, Laguna, Batangas, Rizal and Quezon. When descending, instead of going back to the jump-off point in Ternate, Cavite, traverse to Nasugbu, Batangas and hit the beach. How to get there? From Metro Manila, ride a bus going to Ternate at the Coastal Mall bus terminal in Parañaque City. From Ternate, ride a tricycle to DENR jump-off area to Pico de Loro. On the other hand, it’s just a tricycle ride going to Nasugbu beach. The trek to Mt. Daguldol starts and ends in beach. You’ll be walking at the seashore of Laiya beach on your way to the mountain. Admittedly, Mt. Daguldol is one of my toughest climb experiences though it’s only a minor climb with a difficulty level of 3 out of 9 and trail class of 1 to 3. Maybe because it was a long walk of up to six hours. But, the scenery is worth the effort! Laiya beach is a great reward after the tiring trek, by the way. How to get there? Take a San Juan (Batangas)-bound bus from the Cubao Central Bus terminal. Then, you may choose to take a jeepney or tricycle going to Barangay Hugom. There’s no beach near Mt. 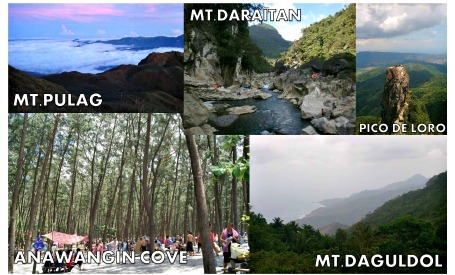 Daraitan, but this mountain can offer an unforgettable and unique summer getaway. Enjoy your summer doing activities such as spelunking, rock climbing, river swimming, and camping. Inside the Tungtong Cave in Daraitan, which is just across the campsite, is a nature-made pool -- they call it jacuzzi. How to get there? Coming from Metro Manila, ride a jeepney or SUV Express going to Tanay in front of Starmall in Shaw Blvd., Mandaluyong City. From Tanay market, you can take a tricycle going to Barangay Daraitan. Like Mt. Daraitan, Mt. Pulag in the Cordilleras may not have nearby white-sand beaches but its single-digit temperature is a good trip to escape the summer heat. It can’t offer a sea but its sea of clouds is worth climbing for. Climbing Mt. Pulag, the highest peak in Luzon and the third highest in the Philippines, can give you bragging rights in your entire life as climbing this mountain is really a challenge, requiring you two to three days for this trip and surviving the single-digit temperature. It’s best to climb Mt. Pulag during summer so you can’t experience the chilling negative-degree-Celsius temperature during the cold season and the wet trail during rainy season. How to get there? Take a bus bound for Baguio City. If you’re travelling in group of 10, it’s better to rent a jeepney to registration point for Mt. Pulag. If travelling alone or in smaller group, better avail of a tour package for this adventure.